We are not medical doctors, all we are doing is telling people that the nutritional benefits of the quail eggs are huge compared to the chicken eggs. Below is some interesting content we found containing the benefits of quail eggs. Quail eggs are undoubtedly very nutritious and are proven to have numerous health benefits that cut across many illnesses and health conditions common to all ages, he is literature from the internet and printed publications on the health benefits of quail eggs with a view of simplifying it on this site for your benefit. Despite varying opinions by numerous authors, it still remains a fact that Quail eggs have some basic characteristics that are common to all views. These key essential nutrients all packed in one small Quail egg makes it a prized dietary & healing food that you should consider to take regularly. It is recorded that Chinese medical practitioners have used quail eggs for thousands of years in the remedy of diseases. British researchers say that eggs should be pronounced a super food. It is said to be one of the richest in good and essential ingredients and we should consume them daily. Foetal and child brain development. QUAIL EGGS FOR A HEALTHY SKIN. Does it embarrass you to let others see? Quail eggs can provide four solution and many more. There are many who suffer from skin conditions, common among which are; eczema, psoriasis, skin damage. e.t.c. Those affected are often embarrassed by these conditions and often hide behind their clothes at all times. Avoiding public swimming pools in day light or even take some fresh air at home. Good news is you need no longer worry. 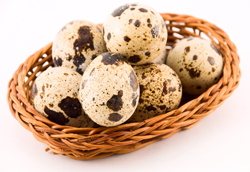 Quail eggs contain nutrients that constitute greatly to maintenance and prevention of these skin allergies. Quail eggs control allergic skin condition by healing skin damaged from eczema & psoriasis and minimizing future skin flair-ups. Quail eggs are rich in essential fatty acids, thus provide a natural remedy for cell moisture. This is necessary for healing skin damaged from excessive dryness, cracking and peeling by continuously hydrating the skin. Quail Eggs have vitamin B2 riboflavin and vitamin A retinol necessary for repairing damaged skin tissue. It also has high alkaline- to- acid formation that will help minimize flair-ups. Quail eggs contain Vitamin B12 that will help inhibit the production of inflammatory cytokines, a primary cause of allergic skin conditions. The most recognized solution for avoiding skin flair-ups is to strengthen our immunity system by rectifying Vitamin and mineral deficiencies. Products rich in Vitamin A retinol heals damaged epithelial tissue associated with eczema. Quail eggs are not only rich in vitamin A, they are among the only sources of retinol with good cholesterol (HDL). Poor sexual desire and performance is a common condition among men who are deemed not to have a healthy prostrate. Most at times, in order to live a healthy and satisfying sexual life, victims have to schedule their desires and performance around one pill or the other. Some prescription based sexual stimulates can effectively boost a man’s libido, but many of these are said to suffer from certain side effects like cotton mouth, achiness and stomach pains. They may be dangerous if the person taking them has ever had a heart condition or experienced stroke or hypertension. In order to avoid these uncertainties, it is strongly advised that you enrich your body and prostrate with quail eggs. Quail eggs give you better blood circulation and strengthen your heart muscle, which in turn boosts libido and gives you better sexual performance. Quail eggs are enriched with, phosphorus, proteins, and vitamin B, vitamin D and vitamin E. these essential nutrients stimulate and nourish the prostate gland which is vital to a man’s sexual health. Quail eggs aren’t time based like other drugs, so you can always have them on the go. They will help increase your sexual stamina and potency naturally without side effects. All you need do is to incorporate quail eggs in your daily diet intake. What are you waiting for? Go grab your quail eggs right away and start a very healthy living lifestyle with your spouse and feel like a complete man with more confidence. QUAIL EGGS FOR HEALTHY BODY ORGANS. Quail eggs are a rich source of, antioxidants, magnesium, vitamin B6, potassium and alkaline. If you are a victim of kidney pain, which is caused by a deposit of calcium in combination with oxalates, you should know that natural remedies can flush the stones from your system. Quail eggs provide a natural and non-invasive solution that helps maintain a normal calcium balance so that there is a painless passage and lasting avoidance of stones in the kidney, liver or bladder. The potassium will reduce the excess urinary calcium excretion that often leads to kidney stones. Finding all these overwhelming? Don’t be, nature has provided a fast track to a healthy life. High amounts of vitamin C or other sources of oxalates combine with calcium and reduce its ability to be absorbed. This in turn creates calcium stone deposits. As a low oxalate, on the other hand the calcium in quail eggs is readily absorbed into the body. One of the most common stomach discomforts among Nigerians is stomach ulcers, gastritis, and duodenal ulcers. Quail eggs are high alkaline forming and have antioxidant nutrients, as a food rich in selenium and vitamin A, quail eggs qualify as an antioxidant. These characteristic of quail eggs makes them an effective all-natural alternative to over-the counter ulcer remedies that reduce stomach acid levels. You could easily incorporate quail eggs into your diet to establish a silent but lasting relief from ulcers and acid related discomforts. This is justified through clinical studies using natural anti-oxidants to treat peptic ulcers and gastritis caused to oxidative stress and free radical overload. QUAIL EGGS AS RELIEF FROM MEDICAL CONDITIONS. Here I will mention a few known medical conditions that can be alleviated by consuming quail eggs. QUAIL EGGS FOR HEART CONDITIONS. Quail eggs are known to have little or no carbohydrates. They contain HDC cholesterol i.e. high density lipoprotein. It is awell behaved cholesterol which cruises the bloodstream, as it does so it reduces the risk of heart disease by controlling and lowering the blood pressure. Heart disease is a known cause of death in many Nigerians especially at advanced ages. To treat heart disease, people tend to exercise and eat a healthy heart diet. Quail eggs as a food in your diet will extend, you r life span by control and lowering your blood pressure and reducing heart disease because they are foods rich in folic acid, vitamin B12, iron, phosphorus, protein, riboflavin, selenium. Quail eggs are definitely a necessary choice for this process/ condition. The use of pesticides and other chemical treatments prevalent in our processed foods and water supply is enough cause to worry as there are sure tickets to cancer as we are constantly exposed to toxic free radicals. Quail eggs qualify as antioxidants since they are rich in vitamin A and selenium thus they are recommended to prevent cancer by protecting cells from these free radical damages. Quail eggs can be consumed by those undergoing cancer treatments to increase their alkaline which makes an environment unsuitable for cancer growth. Anaemia is a condition in which the body does not have enough healthy RBCs which provide oxygen to body tissues. Anaemia can be due to Vitamin B12 deficiency, iron deficiency, and foliate deficiency. We will not delve into the nifty gritty of the disease but there are facts to show that, toxins can be removed with quail eggs as they contain antioxidants. These will clear the toxins in the body and the cells. Quail eggs are a known source of 100% natural source of iron, vitamin A and vitamin B12. With these you may not need the traditional iron shots and pills or transfusion or surgery. Quail eggs will naturally ease the symptoms of anaemia. Almost 90% of a child brain is developed by the age of 5. We have to make sure the children have what they need to succeed. There are three exceptional advantages derivable from quail eggs consumption by children. Quail eggs contain Omega-3 fatty acids for fetal brain function and neural development. Quail eggs contain choline and Omega-3 & 6 for continuous child IQ development. They are kid friendly brain nutrition without the sugar associated with kiddie’s food. The effect of under nutrition on young children (ages 0-8) can be devastating and enduring. It can impede behavioral and cognitive development, educability, and productive health, thereby undermining future work productivity. For many years, the quail eggs has been the main staple of Asian diet as nutritionist and doctors recognize its benefits in promoting good memory enhancing the brain activity and regulating the nervous system. Quail eggs are a natural source of choline, which produces the neurotransmitter acetylcholine, needed to improve brain development and produce smart kids. The Omega-3 fatty acid also known as docosahexaenoic acid (DHA) is an important ingredient for optimal brain function. During pregnancy, Omega-3 fatty acids are conveyed from the mother blood fetus by the placenta, they are vital for the development of the brain retina membrane of the fetus. Thus, the amount of DHA the baby receives depends on the mother’s dietary intake of omega-3 fatty acids. Depending on a mother’s diet then, a child’s brain could be starred for Omega-3 before it has a say in the matter and research shows this could actually have a significant impact on the intelligence and vision. In incorporating quail eggs in your child diet, you will have the key element in helping your fetal baby brain, new born baby and even your infant’s baby brain development, and all in one easy process. Meanwhile, you will sleep better knowing you are producing the best foundation for your child growth and healthy brain development. Nutritional diets accounts for about 80% of the benefits derived from healthy life style. Nutritionists have long been interested in the dynamics of telomere length in the body and how to telomere figure into human health and life expectancy. Tiny units of DNA at the very end of each chromosome, the telomere shorten with time because they cannot replicate completely each time the cell divides. Growing research shows that foods that are rich in certain nutrients help protect the length; greatly affecting how long you live. Quail eggs have been found to contain at least 90% of these nutrients. Quail eggs have nutrients which are rich in antioxidants, essential fatty acids, selenium and vitamins A, B and E. this fact makes the quail eggs a perfect choice for an anti-ageing food. Quail eggs will make your skin look young and your body last longer. The quail eggs will strengthen your immunity to diseases and slow the aging of your organs and increase your life span. It also protects the nervous system and brain from oxidative damage associated with age related memory lost. Many people depend on multiple creams, cosmetics and sprays which might not be favorable to your overall health, for good looks and anti-aging. If you want to age gracefully, natural methods such as; healthy life styles, exercise, good rest and a diet laden with Quail eggs can do the trick. With the right nutrients found in Quail eggs, you can attain a beautiful skin and a sound health. Regular consumption of Quail eggs can also help produce healthier skin cell membranes that retain moisture, giving you a younger luscious skin. This is because of the presence of Omega-3 fatty acids Vitamin B, e.t.c. you can consume the Quail eggs in your diet or apply directly to your skin as a therapy and get the beautiful skin you are meant to have. Asthma is a common chronic inflammatory disease of airway characterized by variable and recurring symptoms, reversible airflow obstruction and bronchi-spasm. Common symptoms include wheezing, coughing, chest tightness and shortness of breath. (Wikipedia). 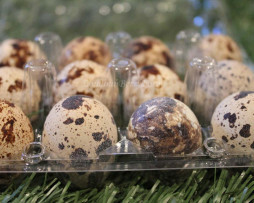 Quail eggs provide an effective natural alternative to conventional antihistamiries that help reduce the mucus obstruction to airflow by inhibiting the production of harmful chemicals (e.g. histamines, IgE and free radicals) in our bodies. Quail eggs are a rich source of Vitamin A retinol and antioxidants; it acts as a natural histamine suppressor while healing the mucus membrane. Asthma is growing at an alarming rate, even here in Nigeria. Some researchers associate the growth of asthmas to environmental factors and others believe that diets can plan a significant role in stopping flair-ups. Food rich in antioxidants and essential fatty acids could serve as anti-inflammatory agent. Quail eggs, in particular are very rich sources of Vitamins A and Selenium thereby qualifying them as anti-oxidants that can improve the lung function. It also has a high ratio of Omega-3 to Omega-6 fatty acids, reducing inflammatory without the uneasiness of applying inhalers.